PM #40762529 $5.00 • Vol. 29, No. 35 November 5, 2018 L AW TIMES C O V E R I N G O N T A R I O ' S L E G A L S C E N E • W W W . L A W T I M E S N E W S . C O M Alumni, students decry U of T's law school fees Mireille Giroux wants the University of Toronto Law school to pause and examine its finances before hiking tuition again. Photo: Robin Kuniski CRIMINAL LAW Award for long-time defence lawyer P5 RETAIL CANNABIS Familiarity with new laws needed P7 FOCUS ON Environmental Law P8 BY ANITA BALAKRISHNAN Law Times C urrent and former stu- dents of the University of Toronto Faculty of Law say the school should cap annual tuition to $40,000 per year until the school can perform a fi- nancial review. Alumni and students are also urging the school to release infor- mation around how alumni dona- tions work, how much students at the school receive in financial aid and the expenses to which the school is currently committed, such as faculty. Lawyers who support the tu- ition cap say spiralling student debt is contributing to issues fac- ing the profession, such as mental health struggles and lack of law- yers from diverse socioeconomic backgrounds. "I don't know if, even with fi- nancial aid, I would be able to at- tend the Faculty of Law now. I find it extremely regrettable. It just goes against many of the inclusiveness and recruitment initiatives I know the faculty does," says Mireille Gir- oux, an associate at Koskie Minsky LLP in Toronto, who graduated in 2012. "At this point, many of us [alumni] feel that we are becom- ing less able to recommend young people to attend the University of Toronto Faculty of Law because the tuition fees are so high, and, ultimately, can just be so limiting in someone's life and career after- wards that it's just not worth it." At the end of September, the law school announced a goal to raise $20 million from alumni for student financial aid by December 2019. The campaign — called "Excel- lence without Barriers" — was the largest bursary-focused campaign at any Canadian law school, the university said in an announce- ment. The university also said in its announcements of the fundrais- ing campaign that the University of Toronto Faculty of Law is the only law school in Ontario to of- fer "strictly needs-based student financial aid" and that "privately supported endowments" are about a third of the yearly financial aid budget. 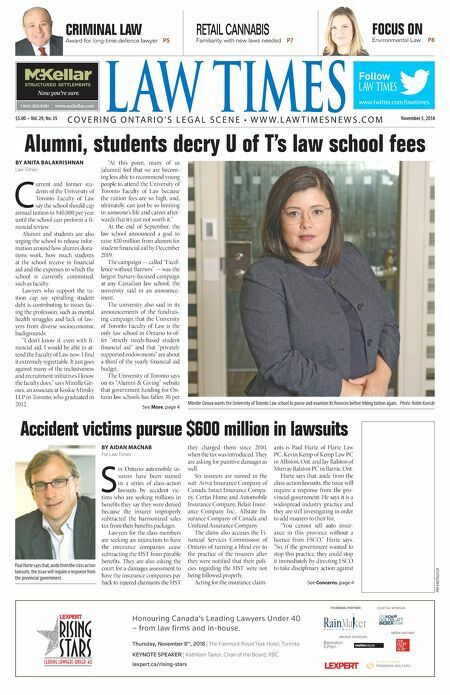 The University of Toronto says on its "Alumni & Giving" website that government funding for On- tario law schools has fallen 30 per See More, page 4 Accident victims pursue $600 million in lawsuits BY AIDAN MACNAB For Law Times S ix Ontario automobile in- surers have been named in a series of class-action lawsuits by accident vic- tims who are seeking millions in benefits they say they were denied because the insurer improperly subtracted the harmonized sales tax from their benefits packages. Lawyers for the class members are seeking an injunction to have the insurance companies cease subtracting the HST from payable benefits. They are also asking the court for a damages assessment to have the insurance companies pay back to injured claimants the HST they charged them since 2010, when the tax was introduced. They are asking for punitive damages as well. Six insurers are named in the suit: Aviva Insurance Company of Canada, Intact Insurance Compa- ny, Certas Home and Automobile Insurance Company, Belair Insur- ance Company Inc., Allstate In- surance Company of Canada and Unifund Assurance Company. The claim also accuses the Fi- nancial Services Commission of Ontario of turning a blind eye to the practice of the insurers after they were notified that their poli- cies regarding the HST were not being followed properly. Acting for the insurance claim- ants is Paul Harte of Harte Law PC, Kevin Kemp of Kemp Law PC in Alliston, Ont. and Jay Ralston of Murray Ralston PC in Barrie, Ont. Harte says that, aside from the class-action lawsuits, the issue will require a response from the pro- vincial government. He says it is a widespread industry practice and they are still investigating in order to add insurers to their list. "You cannot sell auto insur- ance in this province without a licence from FSCO," Harte says. "So, if the government wanted to stop this practice, they could stop it immediately by directing FSCO to take disciplinary action against See Concerns, page 4 FOUNDING PARTNER COCKTAIL SPONSOR Honouring Canada's Leading Lawyers Under 40 – from law firms and in-house. Thursday, November 8 th , 2018 | The Fairmont Royal York Hotel, Toronto KEYNOTE SPEAKER | Kathleen Taylor, Chair of the Board, RBC lexpert.ca/rising-stars THE E B O L G AND MAIL MEDIA PARTNER BRONZE SPONSORS Untitled-5 1 2018-10-25 3:44 PM www.twitter.com/lawtimes Follow & $#&!&jmmm$cYa[bbWh$Yec ntitled-4 1 12-03-20 10:44 AM Paul Harte says that, aside from the class action lawsuits, the issue will require a response from the provincial government.